Can Fish Oil Be Taken at the Same Time as Magnesium? You may take a fish oil supplement for several reasons, including lowering your triglycerides, fighting inflammatory pain and lowering blood pressure. You may use magnesium supplements if you do not get enough of the mineral in your normal eating habits. You also may take it to help control calcium levels if you take a calcium supplement, or to help improve your blood circulation. Because some of the effects of fish oil and magnesium overlap, you should speak with your doctor before combining the two. The reason your doctor may recommend taking fish oil, an omega-3-acid ethyl ester, along with prescribed cholesterol medicines such as fenofibrates, is that it can help to drastically reduce your triglyceride levels. The fatty substances called triglycerides clog your arteries over time, forming hard plaque that decreases the regular flow of blood from your heart through your blood vessels. Fish oil can help to remove the plaque and can prevent new formations of it. This eases the work of your heart by allowing more blood to flow, and it decreases your blood pressure. Fish oil also can help to reduce pain associated with inflammation in your joints. Some research points to fish oil as a gentle mood stabilizer for people suffering with bipolar disorder, too. Most side effects associated with fish oil are non-serious and temporary. These include a taste akin to fish in your mouth, belching and queasiness in your stomach. 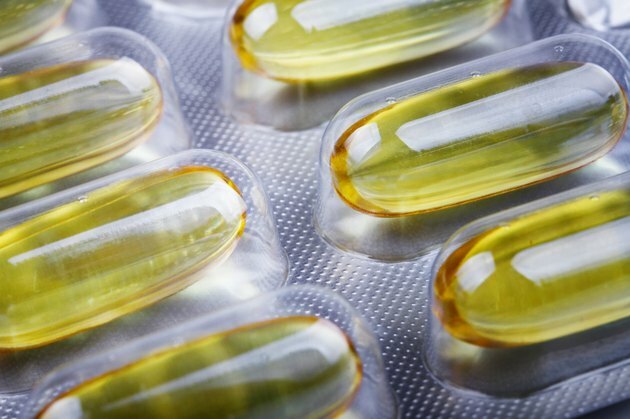 If you use a blood thinner or anticoagulant such as warfarin, fish oil can dangerously increase its effects, so do not take the supplement with these medicines without specific approval from your practitioner. Magnesium helps your muscles, including your heart, to work correctly. It also helps to limit and make more efficient the use of another mineral, calcium, in your body. Calcium can affect the way your heart beats and can cause high blood pressure. If you have excessive calcium in your body, your doctor may prescribe an anti-hypertensive medicine called a calcium channel blocker to regulate it. She also may suggest magnesium to control calcium. Magnesium also essentially relaxes your blood vessels, including your arteries, which can improve circulation and lower blood pressure. Proper amounts of magnesium as a supplement tend to produce minor side effects when you start using it, Drugs.com notes. You may feel nauseous or you may experience pain in your stomach. You also may experience a temporary and mild bout of diarrhea. These side effects typically disappear as your body adjusts to the supplement, but ask your doctor for help if they do not. As fish oil lowers your triglycerides and begins to clear out your arteries, your blood pressure will decrease. As magnesium takes effect, your arteries will relax and open up, also decreasing your blood pressure. It is possible that combining the two supplements can lower your blood pressure too much. This can produce dizziness, lightheadedness, fainting, tiredness and even mental confusion if not enough blood reaches your brain. For this reason, ask your physician about the possibilities of interactions between fish oil and magnesium supplements before you use them together. Combine them only with your doctor's permission. Can You Take Prilosec With Magnesium?